Cutting is one of the basic elements of cooking. To cut food and not yourself you need just few basic rules. You don’t need many of them. Actually 3 are more than enough, but they have to be top quality! If your knife is harp there are much more less chances you end up cutting yourself! The perfect knife will fit in your hand as it was always there, it’s not light, but it’s not heavy, it’s just perfect. Before to buy it, hold it in your hand and you’ll see. Good knives are expensive, but us you are going to buy just three of them you can think of a good budget: do not be thrifty! Chef’s knife: it’s the most used in the kitchen, and you’ll need to cut, chop, mince… It looks like the one in the picture. Paring knife: it’s the little one of the family and you’ll need it to make precise cuts and precise works. Serrated knife: the blade it’s saw like, and you’ll need it for bread, but for aubergines too. When cutting be confident. Don’t be afraid of the big chunk of salmon you have in front of you. Don’t be challenged by the smell of the onion. You are in command and the call it’s only upon you. Go for it! Cut! Once I found myself with a huge whole salmon to cut. I took my knife and there I went: brave, confident, with no hesitations! Even you make one cut wrong, who will see it? And if you knives are good and sharp, well, there is no chance you’ll cut yourself. Choose your tools, be brave, be confident! Your post made us laugh because you make such great points about using knives. It really is easy to collect too many knives when a few is really all you need. 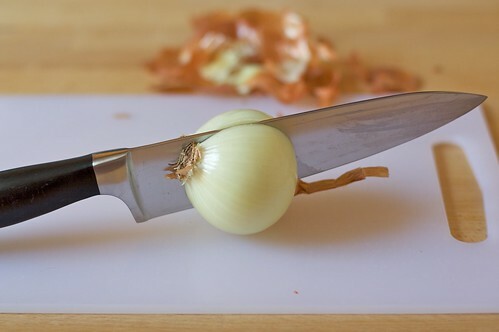 Cutting foods in the kitchen is fun and a very important part of cooking. Many people use and prefer food processors to do the work and they are indeed very useful culinary tools. But knowing how to cut with knives and enjoying the cutting is fun –something many cooks prefer to do and can become almost like an art for some. Great post, nice photos. Thank you for sharing.